Click on the link above to register for a camp. Let us know if you have any questions. SMAS Registration for Summer Camps 2019 will open May 1. These are details from last summer. We will be updating this soon. ¡Este verano SMAS va a tener un campamento de verano! Camps run Monday-Friday 9:00-4:00 with option for after care until 5:00 (additional fee)--see below. $245/Week ($205/week for Competitive Gymnasts), sibling discount $20 off each week. If they sign up for the whole summer (10 camps) only $200/week totaling $2,000 (not including our 2 day gymnastics camp first week of July) This must be paid in advance to get the discount. After hours, would still be in addition to the main price. See below. No regular camp first week of July. But we do have a 2 day gymnastics camp first week of July, open to anyone. Register Now at www.spiritnmotion.com—Space is limited!!! Come to one or come to all of them!!! June 11-15: Super Summer Fun Kick-off Camp-- Welcome to summer camp! This week is all about getting to know each other and spending our first week of camp doing all the things kids love about summers! The kids will be going swimming, making awesome summer crafts, playing games at the park, and making some homemade ice cream! June 18-22nd: Circus Fun Camp-- This week is for the kids to create! We will learn about and discuss things that occur at a circus but the kids will get to create their own games and circus acts that they will showcase at the end of the week. They will spend the week creating posters for their booths or practicing their acts to show their peers in the circus at the end of the week! There will be prizes, snacks, games, and tons of fun! June 25-29th: Science Camp-- This week is all about science experiments! Each day the kids will get to engage in a new science experiment and test them outside. Get ready for some fun, wacky, and wild science! July 5-6 ($125): Awesome Gymnastics Camp: This will be two days of FULL Gymnastics all day!!! We will be doing all events, bars, beam, floor and vault and even learning routines! If you LOVE gymnastics then you won’t want to miss this camp. Camp will go from 9-4 each day. July 19-13th: Disney Week: This camp will be all about everything Disney, and may even include some special guests!!! It is going to be a blast! 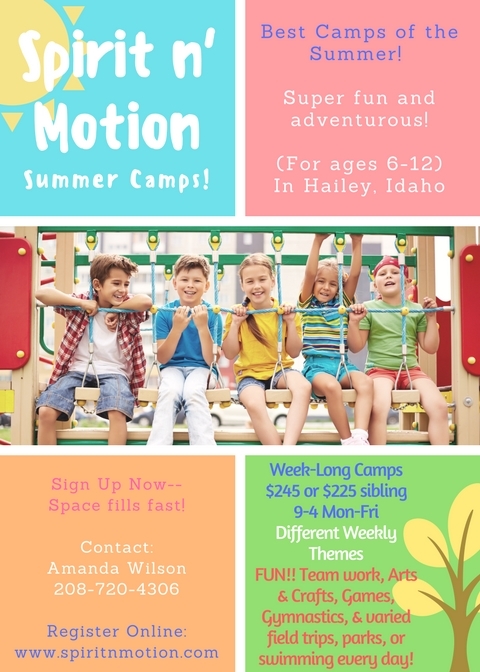 July 18-20th: Outdoor Idaho-- This week we will be learning about and exploring nature, bugs, plants and animals in our environment. One of the fun activities of many we will do is we will build bug houses to observe some of the insects that we see and spend a lot of time outdoors hiking, crafting, and going on scavenger hunts! June 23-27th: Under the Sea--This week is all about the Ocean! The kids will make sand art, create sea creatures, and learn about life under water! July 30th-August 3rd: Space Camp--This week we will be learning all about space! The kids will get to build rockets, create space slime, eat like an astronaut, build a Nebula Jar Galaxy and much more! August 6th-10th: Camping Week: Camping Week--We will be doing all kinds of fun camping games and stories, and activities. It is going to be a blast!! August 13-17th World Travels: This week we will be exploring countries around the world through books, dances, arts and crafts, and food. Contact Amanda at 720-4306 if you have any questions or need help registering. Thanks!